...you can serve it in a wine glass. Since unrepentant wine snobs still walk this earth, I am going to speak directly to them here: Put down the Chateauneuf-du-Pape for a moment. Spend a little time drinking my favorite springtime brew: saison, or what’s come to be called farmhouse ale. I promise this won’t be too much of a letdown, because this Belgian style is about as close to wine as beer gets. For starters, saison is usually sold in wine-like 750 ml bottles. (No cold-activated cans or vortex bottles, promise!) 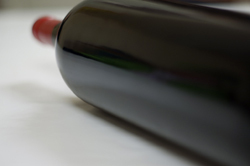 It’s light and complex and has a tart acidity that begs to be served with food. As an added bonus, saison often uses brettanomyces yeast in the fermentation, so you still can have all your wine-geek fun, pointing out those “bretty” characteristics we know you love. Also, like many coveted wines, saison (meaning “season”) has humble rural roots. Farms in French-speaking Wallonia traditionally brewed saisons in fall and winter (during the old days before refrigeration), which were then laid down to be consumed by farmworkers during warmer months. Historically, saisons were low alcohol. 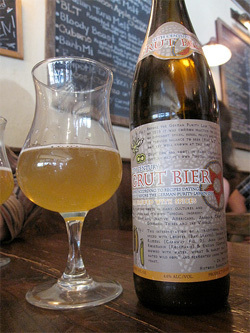 Modern-day saisons, most of which are still bottle-conditioned, run between 6 and 8 percent alcohol. 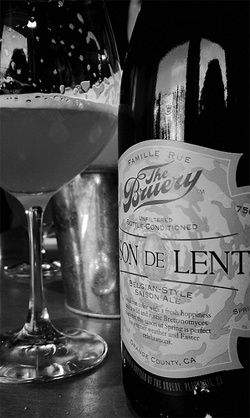 Little more than a decade ago, the style was nearly extinct, even in Belgium, until the resurgent popularity of farmhouse ales like Saison Dupont and Fantôme in the early 2000s. 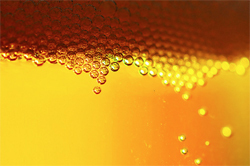 American craft brewers, such as Ommegang and Jolly Pumpkin, particularly embraced the style. Now every spring promises a new batch of great saisons, and many are available year-round. I recently tasted about 20 farmhouse ales from both Belgium and the United States. It was a struggle to narrow them down to six choices. Saisons traditionally varied from farmhouse to farmhouse, and even today it’s hard to pin down an overall flavor profile for the category. For the most part, saisons are refreshing, crisp and dry – usually with an appealing hint of yeasty funkiness. Some saisons are full of spices or pepper, while others are fruity, or zesty with citrus. Some are redolent of flowers, like Southampton Cuvee Des Fleurs or Saison Cazeau. Some have characteristics of Viognier (Ommegang Hennepin) or Sauvignon Blanc (Jolly Pumpkin’s Bam Biere). Some have subtle bitter elements reminiscent of a good Italian amaro (Stillwater’s Stateside Saison). Favorite of our tasting. Crisp and dry like a classic saison, but expansive with a rich creaminess that brings everything into balance. From Placentia, California. 6.5 percent alcohol. The organic version of Saison Dupont, with bigger flavor. Like a sunny spring day on the farm, with fresh cut hay and refreshing orange and herbal notes, along with, yes, a delightful hint of barnyard. From Tourpes-Leuze, Belgium. 7.5 percent alcohol. Earthy, fruity, with a funky nose of wet hay and apricots. Very drinkable and finishes dry. From San Marcos, California. 6.7 percent alcohol. A saison that qualifies as a session beer! Crisp, with refreshing lemon and grapefruit. Admiringly dubbed the “Sauvignon Blanc of Saisons.” From Dexter, Michigan. 4.5 percent alcohol. Sweet peach, honey and vanilla on the nose; lovely breadiness and grapefruit flavors. Admiringly dubbed the “Viognier of Saisons.” From Cooperstown, New York. 7.7 percent alcohol. The biggest monster of the tasting. Thicker and maltier than most farmhouse ales, and needs food, but still refreshes with zesty grapefruit notes. From Fort Bragg, California. 7.9 percent alcohol.